Chess legend Garry Kasparov believes that reigning world champion Viswanathan Anand has lost motivation and the Indian, who is defending his title against Boris Gelfand right now, has been "sliding downhill" for the past few years. "What I think with Vishy is that he has lost motivation," Kasparov said in the commentary room of the championship where he came in as a guest of honour. Known to be outspoken, Kasparov also said that the ongoing World Championship is not the match to decide the best chess player in the world. When asked if the draws will be to Gelfand's benefit, Kasparov opined that it may not be the case. "I wouldn't say that the protracted crisis benefits one player or another, I think they're both under huge pressure. Gelfand hasn't won a single game against Vishy since 1993. "As for Vishy, I think he's sliding downhill these (last) years. He wants to win, he knows he's a better player, but it's not enough," said Kasparov, who is arguably the best chess player ever. Kasparov also believes that the previous matches played by Anand were more intense. "Anand-Kramnik (2008) and Anand-Topalov (2010) were very tense, a lot of ideas, and not just about decisive games, you could see there was so much fighting spirit by both sides. They were also players of the highest calibre and they had a lot at stake, but no one was afraid to take risks," he said. Anand's lack of success in tournaments in the past years also came under the scrutiny from Kasparov. 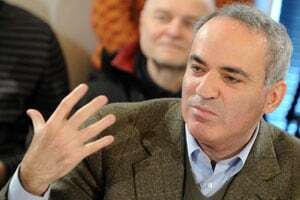 "Hopefully we can still see some sign of greatness of the past but if you look at the record from 2008 to 2012 there are four years and it's not very inspiring," Kasparov said. Another Russian Grandmaster Peter Svidler nodded in agreement. "He (Vishy) hasn't been a great tournament player for years and I think that's a conscious decision by him because he just conserves energy (for the world championship matches)," said Svidler, who is a good friend of Anand. Meanwhile, after playing out a sixth draw on the trot, Gelfand was not impressed with Kasparov's comments. "May be Kasparov wants to remind everyone that he was once the strongest chess player in the world," retorted the Israeli while Anand simply said he did not have time to think about it. The World championship enters the second half with back-to-back white games for Gelfand. So far, it has been a dull affair with neither player managing to push the other in any way. Anand apparently had his chances in game three when he had an extra pawn. Apart from that, the defending champion has been surprised in both his white games even though with black his defenses have been impregnable.